Earn $19.49 in Rewards credit (1949 points) What's This? 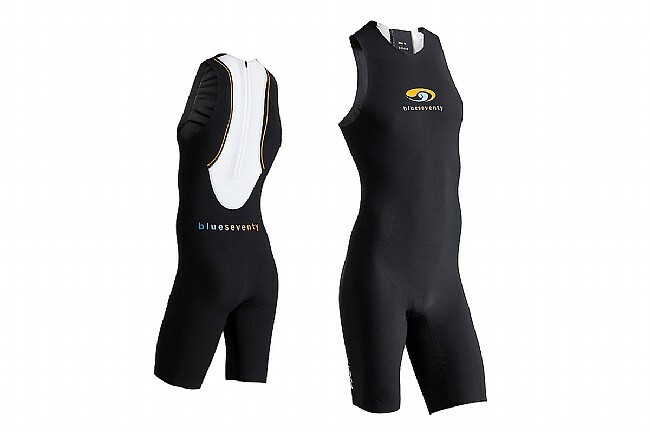 When you find yourself in a warm-water triathlon, cut out the drag and opt for the Blue Seventy PZ2-TX Swimskin. This streamlined swimskin is the result of a decade's worth of research and development. Featuring the compressive Teflon coated Energy fabric and ultrasonic bonded seams, this swimskin cuts through the water while the competition struggles to keep up. Teflon coated Energy fabric provides an excellent fit and exceptional speed. Advanced YKK auto locking zipper removes the need for a lanyard. Ultrasonic bonded seams reduce drag. Compressive fit promotes blood flow, reducing chances of cramping or injury.